I LOVED how Lem Gonsalves (Afterbuzz TV) compared this show to those “Choose Your Own Adventure” books we read as kids! As Alison Dean (Afterbuzz TV) noted, Alison (Ruth Wilson) is uncertain of… everything, b/c their relationship is VERY new, their lives have changed dramatically, and they’re STILL married to other people. Noah (Dominic West) is going into the city to handle the mediation, meet w/ Harry. etc. But Alison (at this point) doesn’t have a life- she’s just reading and hanging out. Robert (Peter Friedman), the older writer at whose guest house they are staying, kindly offers her a ride into town. (FYI: This area is the Hudson Valley.) He and Alison have a nice/friendly convo. I thought he was just a VERY sweet/laid-back guy! We find out that Robert prefers the country; his wife Yvonne (Joanna Gleason) prefers the city. 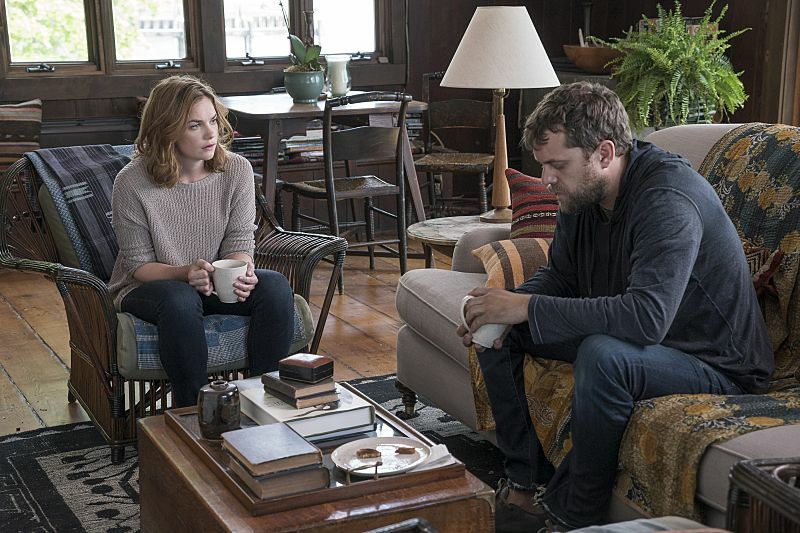 Cole (Joshua Jackson) comes to the house while Alison is out (guess they don’t have locks). When she sees him, she’s surprised and a BIT scared. Cole drove (a long way) to bring her some of her clothes. Then, he offers to fix the toilet (yeah, that was awkward). Yvonne comes over to invite Alison to tea later that afternoon. She sees Cole, who has repaired the toilet, and asks is he’s single. She has a niece who likes guys like him, she comments. Before he leaves, Cole gives the toy chest that belonged to their late son to Alison (awww…she is shaken up/close to tears). At tea, Alison admires the beautiful main house. Robert, is was recently injured, hobbles in w/ his cane. Yvonne gives him a sandwich to eat. She comes off as more Type A than her husband; it turns out that she desperately needs a personal assistant. Robert offers Alison this job; we learn that Yvonne runs a publishing house (cool, BUT a LOT of work). When Noah comes home and learns about the job offer, he gets mad. They are already staying in this house for free, so it’s TOO much to get money from them. Alison is surprised/upset by his reaction. A few moments later, they make up (yes, they are STILL hot/heavy)! Flash forward: Alison (w/ baby girl) goes to the Suffolk Co. courthouse and runs into Noah’s lawyer, Jon Gottlief (Richard Schiff- Toby from The West Wing). She gets mad when she learns that Helen is paying for this guy. Bruce Butler (John Doman) gets in Cole’s cab (that’s his job since losing the ranch) and talks about his new life. It turns out that he’s divorcing Margaret (NOT such a shock)! He also talks about what’s been happening w/ his son-in-law (Noah). Cole mostly listens quietly, but we know that he’s keenly interested. After dropping Bruce at a house in Montauk (it’s NOT his place), Cole back the cab up and ALMOST hits a little boy (yikes)! A pretty young woman grabs the boy just in time. We learn that her name is named Luisa; she is the babysitter of the boy, not his mom. So, how is this kid connected to Bruce? Hmmm… we know that Bruce just got back from a vacay w/ his old flame from Michigan. They are now together; she is quite a BIT younger than him (we know from S1). Poor Cole! He’s driving TOO much (24 hours), dealing w/ jerky/drunken passengers, and snorting coke (yikes). Also, the Lockhart fam has disbanded (as we learn when Scotty comes by the taxi stand). The meeting between the former couple is VERY different in this version. Alison and Cole drink tea and talk calmly/pleasantly. She lets him down easy, BUT then runs over to give him a LONG hug goodbye! Flash forward: Cole meets Alison and her baby (named Joanie) for the first time. The baby likes him (awww). Inside the courtroom, the charges against Noah are read. Jon says nothing, the bail is set at $500,000, and Noah is taken away. The camera zooms in on Cole and stays there for a time- there is an intense expression on his face. OMG, do you think he killed Scotty!? Cool, will def check out your post/blog! I ALSO wonder if this show’s writers were influenced by the dual narratives in recent books (EX: “Gone Girl”). Thanks for reading my blog/commenting! It’s certainly using the Rashomon effect to its advantage, and it’s certainly what drew me in as a potential viewer!